On Tuesday, I attended a day long event at the US Department of Education. The event, planned by Leadership for Education Equity and Teach For America, brought together 150 people within the field for a day of speakers, panels, and question and answer session with the highest federal education policy advisers. The highlight of the day was definitely getting a chance to ask US Secretary of Education Arne Duncan questions and hear his responses. Taking a quick shot outside the White House. 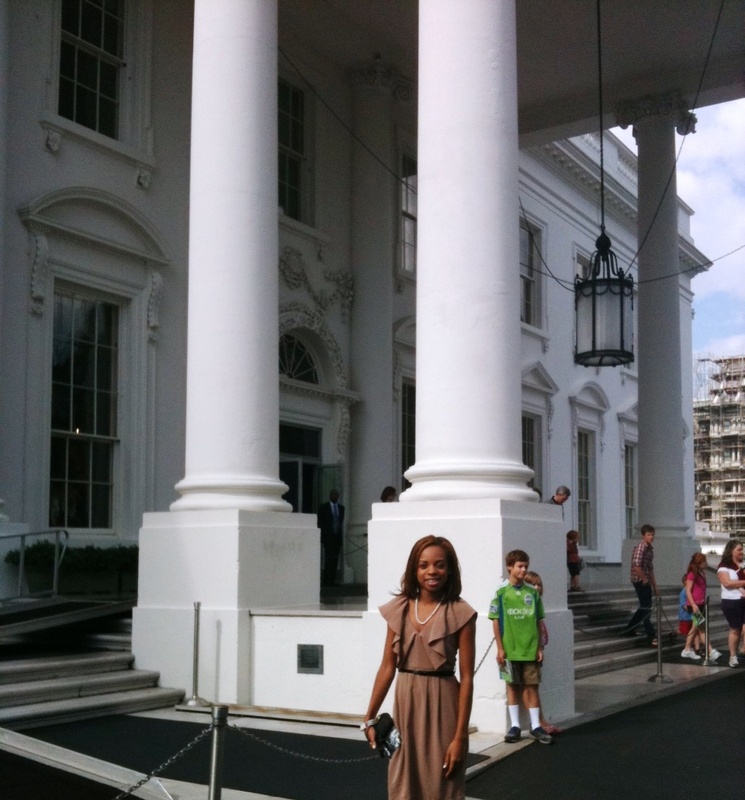 The day began with a brief tour of the White House. After the tour, I trekked over to the Capital Hill Holiday Inn to officially start the day. I heard from several speakers including two of the Department of Education’s Teacher Ambassador Fellows. They emphasized that the department really wants to hear from teachers. Both women are lifelong teachers, who are taking a year off teaching to go around the country, lead town halls and focus groups, and report back to the department, among other things. I got a chance to chat with one who’s interested in visiting my school and learning more about our turnaround work. I hope we are able to connect in the near future. During lunch, there was school board panel that was of particular interest to me. One of the panelists, Tina Hone, At-Large School Board member in Fairfax County in Virginia, shed light on her experience as a minority on a board comprised of people who differ greatly from her on various issues. (She’s a Democrat, most of the people on her board are Republican.) She spoke about being willing to take a stand–even if that means you will lose the vote. I thought that was so timely and extremely important in this day, when so many people comprise for the common good. As proponents of the common good, we must not comprise on what we know is true and just for Americans. I applaud her for her dedication and fearlessness in the face of opposition. After lunch, it was time to head over to the US Department of Education to hear from the chief– Secretary of Education Arne Duncan. Duncan wore some slacks and baby blue button up, which matched his calm demeanor. He spoke for about 10 minutes and then went right into questions. “I want to see more teachers in unions,” said a stern Duncan. He said that more teachers need to be told to join their unions and get involved. He said, “that’s where change will happen.” Duncan also talked briefly about the egos of many reformers and how that mentality is counterproductive to the education reform movement. I completely agree with his sentiments. The back and forth between the “new reformers” and “old reformers” needs to cease. I do not completely agree with either side, and believe that the labeling and trash-talk hinder our progress in the field. Furthermore, Duncan also went on clearly state his priority of pushing colleges of education to better prepare teachers. He stated plans to track college of education graduates and how effective those teachers are in the classroom. Duncan emphasized that it is imperative that we bring the teaching profession to the prestige of being a lawyer or doctor, and that we must pay teachers more. Duncan understands that many teachers find it difficult to live off their salary, and that is one reason why it is difficult to attract and maintain talent. The department is researching ways to be innovative in the future of teacher pay. Although questioned about teacher evaluations, and more specifically, linking teacher pay to test scores, Duncan said that “… just because a system isn’t correct, doesn’t mean we do away with it altogether.” I understand how he feels about this. However, what concerns me is linking teacher evaluation to test scores without adequate professional development and ongoing support. Ensure that teachers have equal opportunities to develop, while simultaneously evaluating their progress. Also, Duncan stressed strategic push for more people of color–particularly Black males–in the profession. He said that he has been traveling around the country discussing this issue, and related the lack of Black and Latino males as teachers has an impact on how schools are able to support Black and Latino males. It was a pleasure to here from Secretary Duncan. Overall, the day was extremely insightful for me as a classroom teacher. Rarely do teachers get a chance to engage with policy advisors and policy makers so I thank the Leadership for Education Equity and Teach For America for planning this event. While I do not agree with every solution Secretary Duncan presented, I did believe that he is in fact seeking teacher input. During the last panel of the day, the department’s Communications’ Director said it best, “We’re just the bully pulpit. The real work happens on the grounds.” I could not agree more. The department can only do, but so much in their position. It is teachers, administrations, and communities that can lead grassroots, systemic change. Each child is born with special talents to give to the world that are developed through a supportive community and quality school system. Currently, our nation is producing adults who are walking around with no sense of purpose or life fulfillment. Join me as I unite with other people in reforming America's public schools and empowering our nation's youth to find and live their purpose in life. Feel free to comment, debate, give suggestions, and most importantly join me in creating solutions. The banner is a photo of me painting my scholars cheeks as we get ready to tour Catholic University in Washington, DC. Their cheeks were painted with "C" and "U" for Catholic University or "20" "24" on each cheek to represent the year they will graduate from college.